Here’s the second of my electoral map predictions for the November elections. 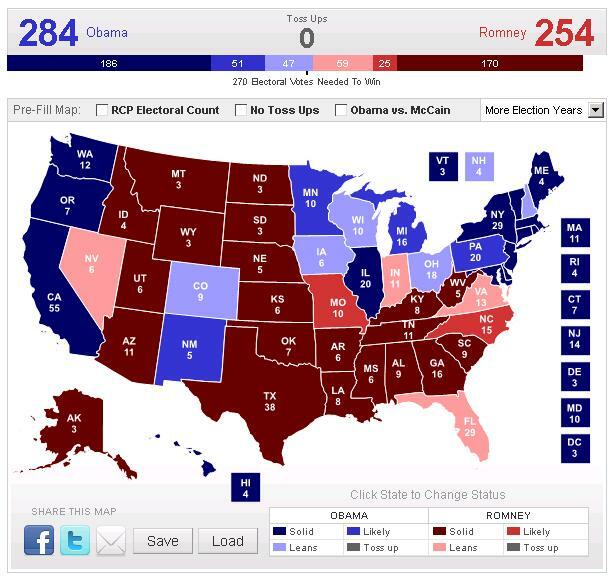 In my first estimate last month, I showed Obama winning with 297 electoral votes. Interestingly, Intrade.com now has Obama up to a 56 percent favorite, which is higher than he was on June 6. So either I’m wrong in thinking the race is moving in Romney’s direction or Intrade.com is wrong for thinking it is moving in Obama’s direction. You can decide who to believe. Just keep in mind that my 2010 election predictions were very accurate and Intrade.com was wrong on the Obamacare Supreme Court decision. P.S. My ex generated some controversy with her comment about “real Virginia,” but I’ve always been mystified by the kerfuffle. Just look at this map and see how the counties in Northern Virginia are among the wealthiest in America thanks to all the loot being redistributed from the rest of the country to the metro-DC area. Those looters and moochers have very little in common with the people in the rest of the Commonwealth. Remember back in 2009, when President Obama and his team told us that we needed to squander $800 billion on a so-called stimulus package. The crowd in Washington was quite confident that Keynesian spending was going to save the day, even though similar efforts had failed for Hoover and Roosevelt in the 1930s, for Japan in the 1990s, and for Bush in 2008. Nonetheless, we were assured that Obama’s stimulus was needed to keep unemployment from rising above 8 percent. Well, that claim turned out to be quite hollow. Not that we needed additional evidence, but the new numbers from the Labor Department re-confirm that the White House prediction was wildly inaccurate. The 8.2 percent unemployment rate is 2.5 percentage points above the Administration’s prediction. Defenders of the Obama Administration sometimes respond by saying that the downturn was more serious than anyone predicted. That’s a legitimate assertion, so I don’t put too much blame the White House for the initial spike in joblessness. But I do blame them for the fact that the labor market has remained weak for a lengthy period. This chart, which I just generated this morning on the Minneapolis Fed’s interactive website, shows employment data for all the post-World War II recessions. The current business cycle is the red line. 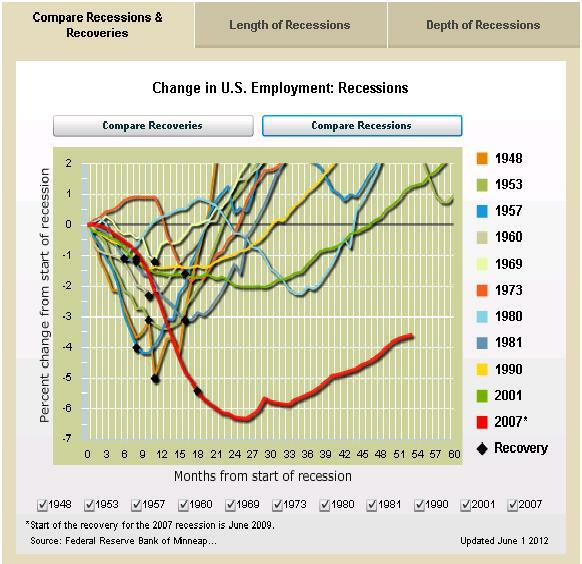 As you can see, some recessions were deeper in the beginning and some were more mild. But the one thing that is unambiguous is that we’ve never had a jobs recovery as anemic as the one we’re experiencing today. Job creation has been extraordinarily weak. Indeed, the 8.2 percent unemployment rate actually masks the bad news since it doesn’t capture all the people who have given up and dropped out of the labor force. 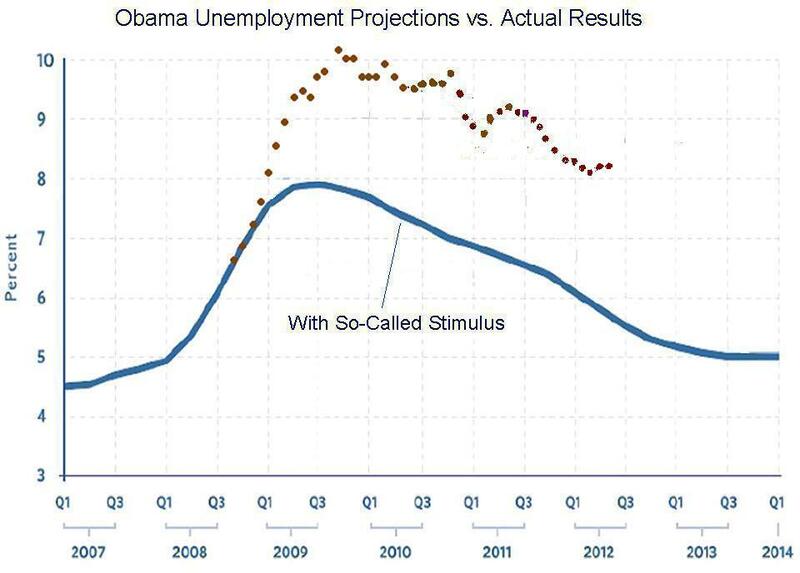 By the way, I don’t think the so-called stimulus is the main cause of today’s poor employment data. The vast majority of that money was pissed away in 2009, 2010, and 2011. Today’s weak job market is affected by things such as the threat of higher taxes in 2013 (when the 2001 and 2003 tax cuts are scheduled to expire), the costly impact of Obamacare, and the harsh regulatory environment. This cartoon shows, in an amusing fashion, the impact of these policies on entrepreneurs and investors. P.S. Click on this link if you want to compare Obamanomics and Reaganomics. The difference is astounding. P.P.S. Obama will probably continue to blame “headwinds” for the dismal job numbers, so this cartoon is definitely worth sharing. P.P.P.S. Since I’m sharing cartoons, I can’t resist recycling this classic about Keynesian stimulus.